College students need a lot of supplies for college life: from bedding to electronics to school supplies, the costs can add up. In 2017, families spent as much as a mortgage payment or more on school supplies and that’s not counting tuition! Is your college investment protected? Certain insurance products can help your family protect what you’ve invested in your student’s college experience, from personal property to the cost of a trip to the campus health center during flu season. You’re probably bringing a laptop, smartphone, tablet, TV, speakers, dorm decor, clothes and school supplies with you to college. Maybe you’ll even bring a bike or some furniture. The cost of these belongings can add up – what would you do if they all needed to be replaced due to a fire on campus? Or if your big-ticket items, like your laptop or bike, were stolen – could you afford to replace them? Insurance can help you and your family protect your belongings if you face a loss or damage due to a covered event, like theft, fire or water damage. There are two primary types of insurance that can help you and your family protect your belongings while you’re at school: homeowners and renters insurance. If your parents have a homeowners insurance policy, you may already be covered, but be sure to check the specifics of the policy. Many homeowners policies will only cover full-time students living on campus, and often at a percentage (usually 10%) of the policy limits. Be sure to take into consideration the deductible as well as a claim’s effect on the premium. Renters insurance can be a good alternative in these areas, as renters plans typically feature low deductibles and often low monthly rates. To make the most of your insurance protection, you should create a home inventory of everything you’ve brought with you to school and how much it cost. Taking photos and carefully taking record of everything you have will make it much easier to determine what has faced a loss if you need to make a claim. The total cost could surprise you, and knowing how much all of your stuff is worth can help you determine whether 10% of your homeowners limits or the limits you chose on your renters insurance policy are adequate protection. Leave valuables at home if possible – While it may be necessary to take a computer or sports equipment to campus, other expensive items, such as valuable jewelry, luxury watches or costly electronics, should be left behind or kept in a local safety deposit box. Engrave electronics – Engrave electronic items such as computers, televisions and portable devices like iPods with the student’s name or other identifying information that can help police track the stolen articles. Always lock your room door and keep your keys with you at all times, even if you leave briefly. And not just at night—most residence hall thefts occur during the day. Insist your roommates do the same. Do not leave belongings unattended on campus. Whether you are in class, the library, the dining hall or other public areas, keep book bags, purses and laptops with you at all times. These are the primary areas where property theft occurs. Newfound independence, the stress of classes, dining hall food, all-nighters, community living, partying – the college lifestyle, if unchecked, can take its toll on students’ health. Many schools require that students have health insurance, and for good reason: it can help protect students and their families from the high costs of medical treatments in the case of an injury or illness, like a sports injury during an intramural game or a case of mono. Many schools offer students a health insurance plan, but often the most inexpensive option is for students to remain on their parent’s plan. Under the new health care law, young adults are allowed to remain on their parents’ plans until the age of 26. Check with your parents to see if their plan may be an option or speak with a licensed insurance agent to see what’s available to you. Our interactive health insurance infographic can help you get started. Eat right. There’s a lot of temptation in the dining halls, but adding a side salad and ensuring that you get protein and vegetables and fruits each day will go a long way to giving your body the vitamins and nutrients it needs. Stay hydrated. Swap sugary drinks for water. Getting 8 glasses a day can help fend off fatigue and keep you feeling good. Get sleep. It can be difficult to get enough sleep when there are so many deadlines, due dates, and social events, but you should do your best to get in bed at a reasonable hour and if not, take a nap during the day. Sleep helps your immune system and can help you retain information, so you’re not studying in vain! Manage your stress. College comes with an inevitable amount of stress, but setting aside time to deal with it will make it much easier. Exercise, taking time to relax, reading a book for fun or setting aside an hour to catch up on your favorite show each week will help you unwind and appreciate the many opportunities college presents. If the stress of college life is too much, there are many resources on campus that you can turn too. Don’t wait until it’s too late. Get moving. Exercise is an important part of a balanced lifestyle, and not only will it help you stay healthy, it will make you feel good too. Hit the gym for at least 30 minutes several times a week and try to walk as much as possible. Getting your blood pumping will relieve stress and help you study smarter. Perhaps the largest expense of all, more than airfare, a laptop, gas or a flu shot, is tuition for many families. Luckily, this too can be protected by insurance. Tuition refund insurance can help refund lost tuition if should a student be forced to withdraw from school, as recommended by your doctor, for a covered medical reason. Many schools do not refund most tuition after the first couple weeks of the semester, which could leave many college families vulnerable. Be sure to check your school’s refund policy, which you should be able to find on the website, and consider whether you need more protection than it affords. Whether it’s traveling to campus from home, traveling to study abroad, or bringing a car to campus, insurance can help protect students from costs that may arise if things don’t go according to plan, like a health issue abroad, a canceled flight or fender bender while at school. Depending on your situation, you may want to consider insurance protection. Car insurance is required if you bring a car to school. Look for a plan that gives you adequate coverage, though you may have to spend more to get more coverage, it will minimize your exposure. Speak with an agent about what coverages are right for your vehicle. Don’t forget to ask if you qualify for a “good student” discount – you could save 5-15%! 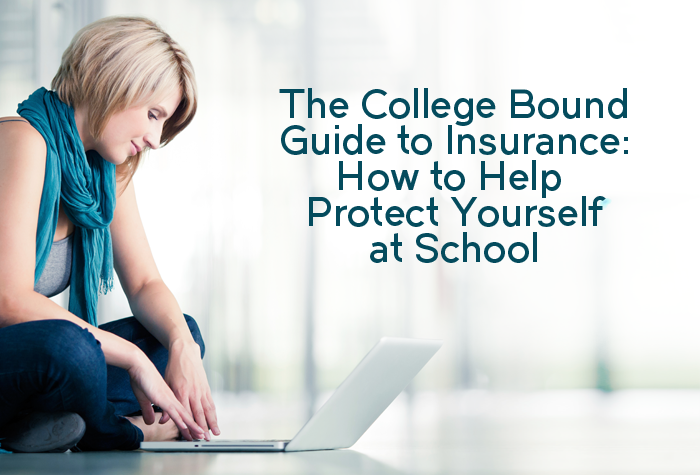 Depending on how far away from home your school is or where you travel to during the school year, travel insurance or a student benefit plan, like the Student Protection Plan, could be beneficial to you and your family. Travel insurance has different levels of features that you can customize for your trip. Most people think of travel insurance as just covering airline ticket reimbursements in case something goes wrong, but it can also protect you financially if you lose your luggage or need to be airlifted to better healthcare, depending on the plan you select. The Student Protection plan also includes medical evacuation as a benefit, as well as family emergency travel and roadside assistance, in addition to identity theft protection and more. Insurance can help college students and their families protect their investment in education. Some of these protections may be beneficial to your family, some may not. It depends on your situation and risk tolerance. If you have questions regarding your insurance coverage for college, speak with an insurance agent for more information. Have a wonderful and safe semester!